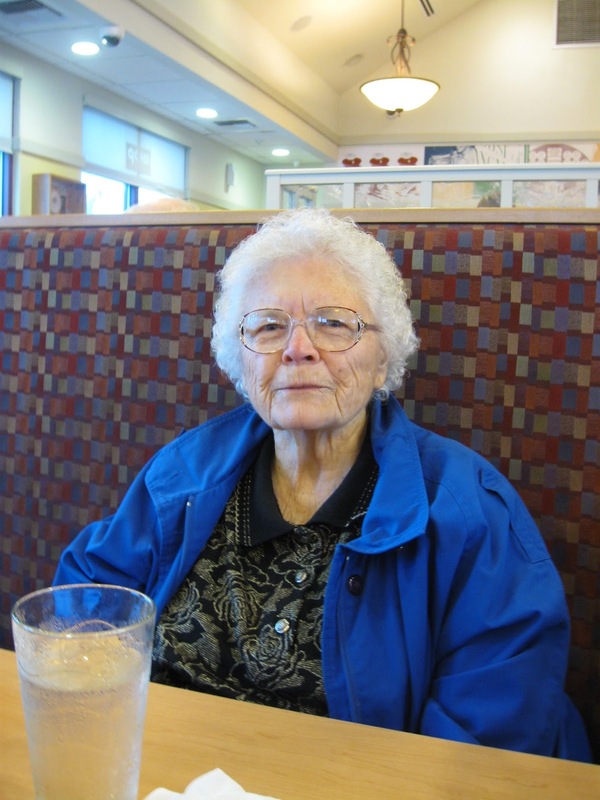 Grandma Sugar celebrates her 84th birthday at IHOP January 16, 2010. 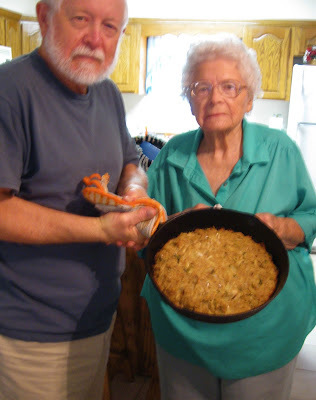 Helen Dorothy Gollott Skupien, my husband Walter’s mother, passed away a little before 6 p.m. Sunday, August 18, after a week in intensive care. 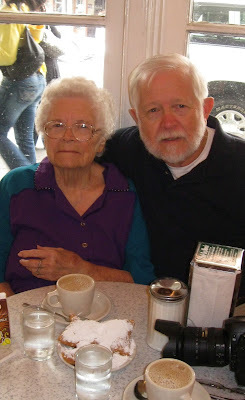 I will miss this strong, outspoken woman who welcomed me into her family almost five decades ago and, by example, taught me much that has made a positive difference in my life. 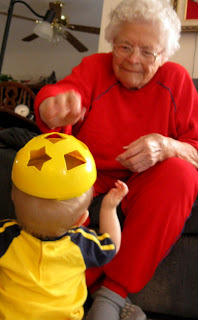 Her nickname was “Sugar” when she was growing up, and she became “Grandma Sugar” when her grandchildren started arriving. A lifelong resident of Biloxi, Mississippi, she was 87 and had survived a multitude of illnesses and surgeries major and minor. 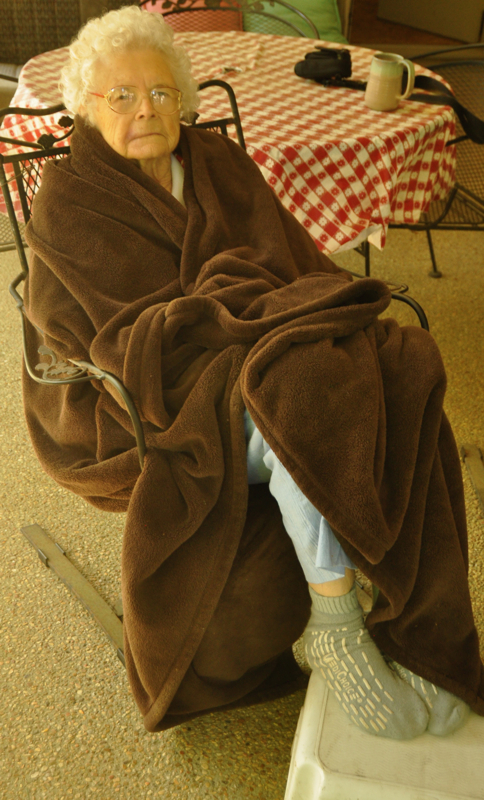 Until the last few years, in spite of chronic health conditions, she maintained an active schedule that included volunteering, traveling, visiting, crocheting, ceramics, expert bargain hunting, and enjoying the iconic events that the Mississippi Gulf Coast offers. Strong-willed and with definite opinions on public issues and personal behaviors, Grandma Sugar was not shy about expressing her views. She was also not much for giving out lots of hugs and kisses. No, her giving was love in action. She prepared and hosted holiday meals in her home for community police, firemen, friends and family. She made new friends and engaged them in local activities and travel. 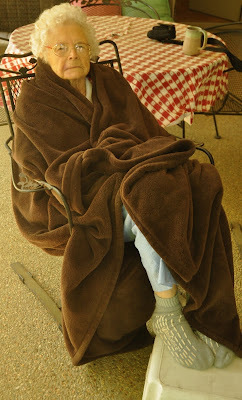 She often included in our family holiday events friends who lacked extended family nearby. And with her crocheted scarves, afghans and other crafts, she expressed her appreciation of beauticians, nurses, doctors, family and friends who were part of her life. When she baked her moist and tasty banana bread, she always made a supply of small loaves for assorted relatives and friends, including her grandchildren. Her pralines, gumbo, and red beans and rice became my standard for assessing those regional favorites. Hers were the best. She worked for 15 years in the cafeteria of a Biloxi elementary school during the days when hot meals were actually prepared from scratch on site. 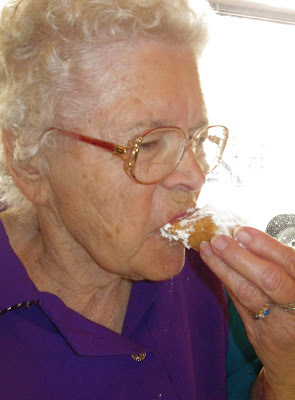 Even when she no longer worked in the cafeteria, her heavenly yeast “school rolls” that she baked were anticipated treats at family gatherings. 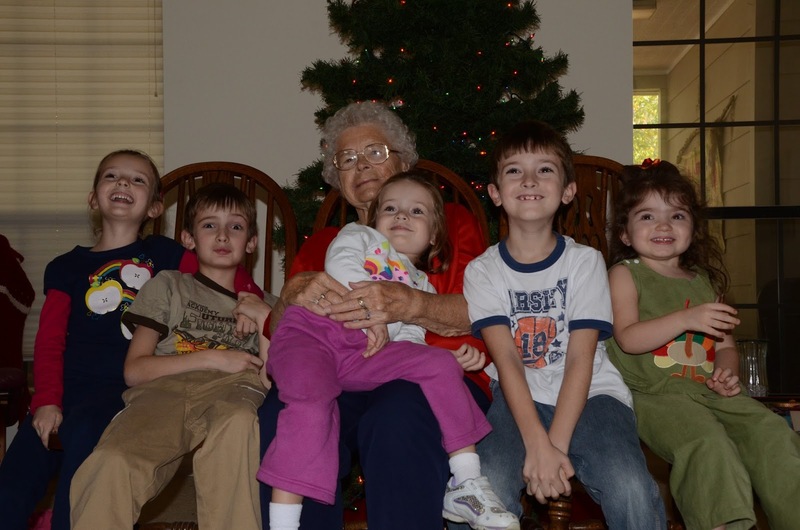 She shopped sales all year long for her grandchildren and later her great-grandchildren’s Christmas. She usually had presents wrapped and ready well before the annual family Christmas celebration. Youngsters could expect a mountain of gifts from Grandma Sugar: toys, games, intriguing novelties, shoes and clothes. 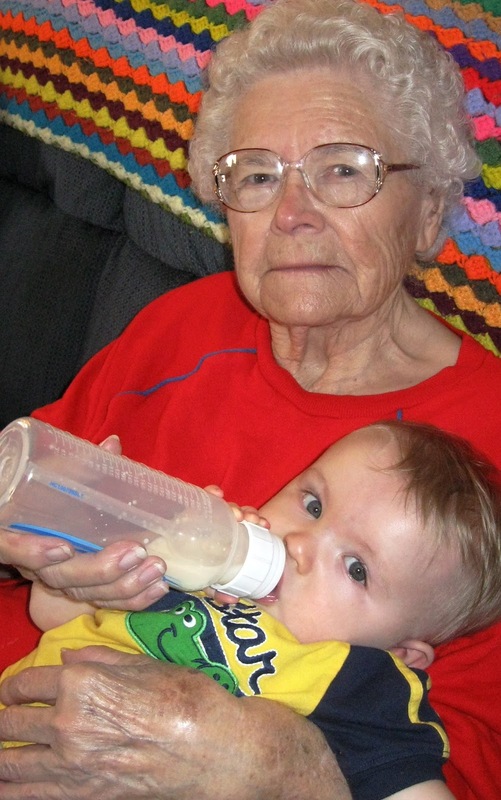 By the date of the party, Grandma would already have started on the following Christmas. She kept a detailed mental record of which gifts were intended for which child, and she enjoyed having her daughter and daughters-in-law slip into the bedroom where she stashed the gifts. She would show us her latest purchases with infectious delight at snagging bargains of 75 percent or more off. And everyone, adults and children, received pajamas. It became such a recurring element of our celebration that one Christmas, all the adults and kids surprised her with our party attire--the PJs she had given us the previous year. Life was never boring around her. 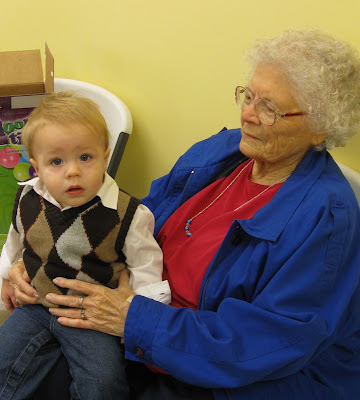 For an always-on-the-go individual like Grandma Sugar, the declining health, energy and independence that she experienced in the last years were a heavy burden for her. I am comforted that we can know she is once again whole, healthy and energized in her new home in heaven with her Lord and loved ones who have gone before. I am so sorry, and I know that Walter must be so very sad. But you have written a wonderful tribute to her, and now many of us feel we know her, and she will live on in that way. She DOES look like a very strong woman, and I love these mother/son photos. What a terrible loss for her family and it seems her vision of family cast a large net. Your tribute of her lets us see her clearly. Such a strong, giving presence she had. I like the image of her being whole again. That mother/ son photo is one I am sure Walter will treasure. What a beautiful tribute you have written to Grandma Sugar! She sounds like a lovely lady, and I know she will be sadly missed by her family and friends. Fortunately, you have some wonderful photographs of her, and I'm so glad you shared a few of them with us! Ed's mom's health has been in decline, lately, and I'm afraid, one day, before I know it, I'll be writing a tribute to my own special MIL. She just turned 91! Thanks so much for the sweet comments you've left, as well as the prayers for Ed (and me) concerning his surgery. What an awesome woman. Makes me feel as if I have done little with my life. The food sounds scrumptios. She must have delighted many a child over her lifetime. Condolences from me to you and Walter. What a lovely story of Grandma Sugar's life. She sounded like an amazing woman! I am sorry for your loss...but she has gained entrance into heaven, and I'm sure she is loving it! She had such a wonderful enthusiasm for life. Sorry for your loss. My condolences to you, Walter, and your family. Your Mother in Law sounds like such an intriguing woman. I can believe you are blessed to have known her. What a heritage. I'm so sorry for your loss but knowing the promise of seeing her again and that she is whole and pain free does make it a bit easier. Thank you for sharing this beautiful tribute with us. I also enjoyed your camping trip to the Smokies. What fun!